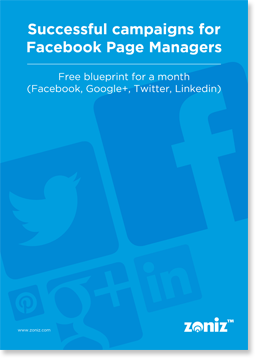 Introducing the FREE Social Media Campaign Blueprint, which is a practical day-by-day guide to help you create a three weeks sustainable social media campaign for Facebook, Twitter, Linkedin, Pinterest, Google+, mobile and website users. Daily posting calendar. Promotional Posts. Non-promotional messages. Weekend announcements. Text and images examples. Getting more fans from your website. Campaign Examples. Facebook posts. Follow up posts. Getting feedback from your off-line visitors. Campaign Examples. Facebook + Twitter posts. Follow up reminders. This e-book is offered for Free by Zoniz™ - The Social Media Marketing Platform. Zoniz™ is the first solution that tells you exactly how to interact with users on a daily basis, and delivers your social media promotions to Facebook, Twitter, Linkedin, newsletters, mobile devices and also on your website.